Peebles Rovers crowned a fantastic season for the Whitestone Park club by beating Premier Division Spartans in the King Cup final at Marine Drive on Saturday. Manager John O’Hara said it was a dream come true for his side to end the campaign with two trophies as they geared up for an assault on The Central Taxis Premier League next season. “To win the league and then win the cup today is a fantastic achievement,” said O’Hara, whose side won the First Division by 14 points, conceding only 29 goals. “We would have been delighted with promotion at the start of the season, but we played an effective game today and we got in their faces, and stopped them from playing their normal attractive free-flowing game. “I was delighted for Frankie Arthur, because it’s his last game. I thought he was brilliant and Dale Richardson, our captain, was superb as well, but it was an all-round good team perfomance. “With the exception of Frankie, we’ll be keeping this squad in place for next season, so it augurs well for the next campaign,” added O’Hara. Spartans EOS manager Alex Cunningham admitted his players failed to perform on the day. “I thought we were poor overall, and our bigger players didn’t turn up for the occasion, and fair play to Peebles who worked harder and deserved their victory,” admitted Cunningham. 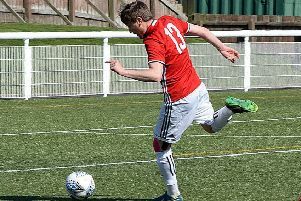 Peebles had the first real opportunity of the game after five minutes when Scott Sutherland capitalised on a slack header by Keith Boyes, but his shot was held by Blair Carswell. Davy Stewart went close with a free-kick for Spartans, before Ian Bannatyne glanced a header just past the post after Craig Stevenson whipped in a cross. Stevenson was then a little fortunate to remain on the pitch after 31 minutes following a high tackle on Peebles right-back Jonathan Flockhart, with referee Duncan Smith issuing a yellow. Bannatyne then missed another golden opportunity when his header went inches wide from a Stewart delivery. But it was Peebles who got the lucky break on 36 minutes when Spartans defender, former Selkirk player Barry Milven, scuffed his attempted clearance from Flockhart’s corner and the ball went in off the near post. The second goal arrived on the hour mark, with Spartans guilty of poor marking from a corner. Peebles captain and player-of-the-season Dale Richardson had a free header from a Daniel McAleavy corner, and the Borders outfit had a healthy lead. Veteran midfielder Frankie Arthur – playing his last game in a Rovers jersey – tried a lobbed effort which came off the post on 77 minutes, before trying his luck again on 88 minutes with the shot tipped over by Carswell. Keith Boyes had one last chance for Spartans at the death, but Darren Walker tipped his header over the bar.